Beijing and Moscow renewed their pledges on Tuesday to align the construction of the China-proposed Silk Road Economic Belt with the Russia-initiated Eurasian Economic Union. In a meeting with Russian Prime Minister Dmitry Medvedev on Tuesday evening, President Xi Jinping said that the two economies are facing a key period of transformation and structural adjustment. The meeting took place on the eve of the Second World Internet Conference in the river town of Wuzhen in eastern China's Zhejiang province. Medvedev is participating in the annual global Internet forum, at which President Xi will deliver the keynote speech on Wednesday. Xi said the two sides should explore new ideas and approaches to expand cooperation in trade, investment, agriculture, infrastructure construction, people-to-people exchanges and other areas. The efforts will produce a mutually beneficial situation and win-win cooperation featured by in-depth integration, he said. The president said he hoped China-Russia ties would make further progress in the coming year to bring more benefit to the two peoples. 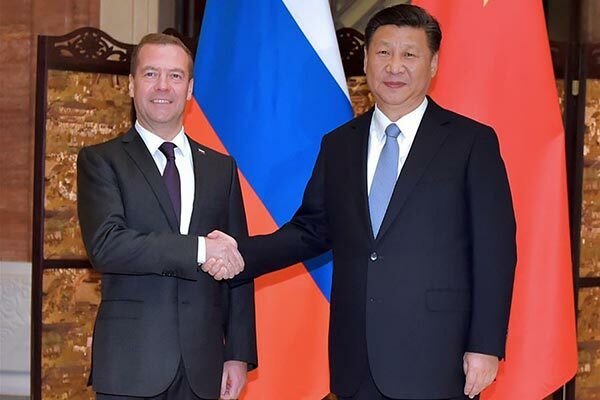 Medvedev said Russia is actively working on the alignment of the two strategies, and is ready to deepen cooperation with China in areas including infrastructure, energy, finance, investment and information networks. He also said Russia would enhance communication and coordination with China in international affairs, and beef up cooperation with China under the frameworks of the Shanghai Cooperation Organization and the Asia Infrastructure Investment Bank. After the meeting, Xi and Medvedev toured the scenic town at night. Medvedev came to Wuzhen after attending the 14th prime ministers' meeting of the SCO in Zhengzhou, capital of central China's Henan province. At the SCO meeting that ended on Tuesday, Premier Li Keqiang said the SCO should speed up connectivity among members. Major railway and highway projects will be undertaken to establish a central Asia-centered traffic network for Eurasia. Sun Zhuangzhi, an expert on Russian studies at the Chinese Academy of Social Sciences, said "China and Russia are embracing new opportunities for their strategic cooperation in the Eurasia region" as they are linking their respective transcontinental strategies.